In 1612 France’s Queen Regent, Marie de Médicis, betrothed her son Louis XIII to King Philip III of Spain’s daughter Anne. Louis and Anne were both ten years old. 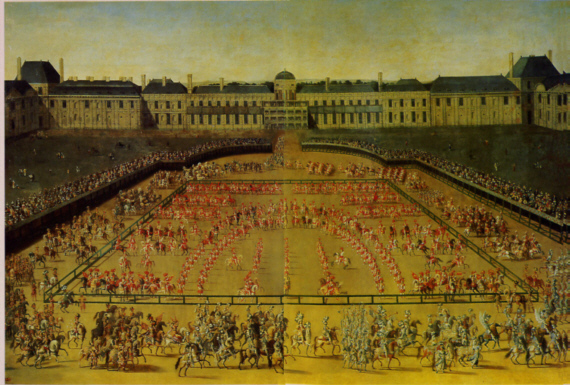 The engagement was celebrated with Le Carrousel du Roi, a lavish public extravaganza that involved magnificently costumed processions, wild beasts, giants, acrobats, elaborate floats, numerous court musicians, and an elegant equestrian ballet. Approximately 200,000 people crowded into the Place Royale to watch the spectacle. This according to “Dances with horses” by Carolyn Miller (Early music America VIII/2 [summer 2002] pp. 30–33). Below, music composed by Lully for a later royal carrousel.